The present procedure will be maintained. Renewal forms and a stamped self-addressed envelope should be sent direct to one of our authorised signatories (at present David Wenker, Ray O’Halloran and Dennis Brooks). Ring first to check the signer’s availability. Sending direct reduces the delay as the Club P O Box is not cleared every day. Annual subscriptions must be paid by the due date to comply with VicRoads regulations. There is no longer a period of grace for payment of club subscriptions. 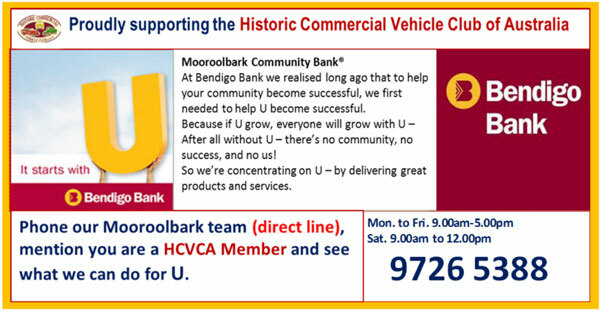 Although photos of vehicles are not required for renewal of existing club permits HCVCA request that renewals during 2015 have photographs included to supplement the records required by VicRoads. A vehicle specification sheet will be made available to go with the photos. The photos required are – front, rear, full length drivers side (door closed), drivers side (door open area).